The CellROX® Deep Red flow cytometry kit (Life technologies) has been developed for the detection of oxidative stress in mammalian cells. It combines a ROS sensitive fluorophore (CellROX® Deep Red) and a "viability” dye (SYTOX® Blue) to allow the detection of non-oxidized, oxidized and damaged cells. The present study investigated the application of these markers to Enterococcus faecalis and Fusobacterium nucleatum subjected to oxidative stress. An optimal concentration of CellROX® has been determined on Enterococcus faecalis and Fusobacterium nucleatum exposed to oxidative stress (H2O2). Bacteria have been exposed to various H2O2 concentrations and labeled with CellROX® to verify that fluorescence increased along with oxidative stress. 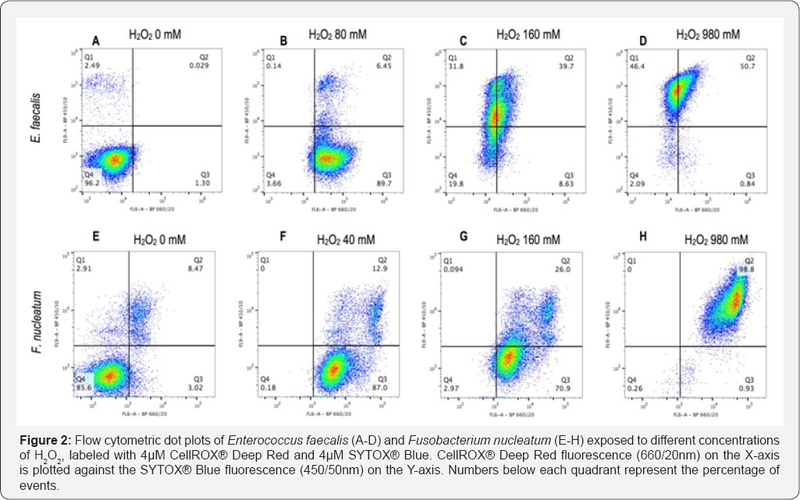 Also, bacteria exposed to H2O2 were double stained with CellROX® and SYTOX® Blue and analyzed by flow cytometry. The optimal concentration of CellROX® Deep Red was 4^M for both strains. Fluorescence of bacteria labeled with 4^M of CellROX® Deep Red increased accordingly with the oxidative stress applied. Flow cytometry analysis of double stained samples showed bacteria subpopulations with increased CellROX® signal when stressed, and higher SYTOX® Blue uptake under higher oxidative stress. Results indicate that CellROX® Deep Red can be applied to measure oxidative stress in E. faecalis and F. nucleatum. The combination of CellROX® and SYTOX® Blue allowed the discrimination of non-oxidized, oxidized and damaged bacteria. Free radicals are defined as highly reactive chemicals exhibiting unpaired electrons such as reactive oxygen species (ROS) . Accumulation of ROS in cells damages nucleic and amino acids, membrane lipids and can initiate self-propagating oxidative chain reactions [2-5]. Developing methods able to correlate oxidative stress with bacterial response and survival would help to gain insight into the development of new antibacterial strategies. Unfortunately, the propensity of ROS to acquire electrons renders them highly reactive, short lived, and therefore very difficult to detect [6,7]. The use of ROS sensitive probes, that can be detected using several analytical methods such as spectrofluorometry, fluorescence microscopy or flow cytometry, offer high sensitivity and experimental convenience [8-10]. The ROS reporters hydroxy-phenyl-fluorescein and "singlet oxygen sensor green" have been previously employed to detect hydroxyl radicals and singlet oxygen in a cell-free model . Dichlorofluoresceindiacetate and flow cytometry (FCM) were used by Subramanian et al. to evaluate whether resveratrol, a redox active phytoalexin, can induce oxidative stress in E. coli . However, the combined use of a ROS reporter with a "viability” marker to simultaneously assess oxidative stress and viability has never been investigated in bacteria. The CellROX® Deep Red flow cytometry assay kit (Life technologies), recently developed to assess the effects of oxidative stress in mammalian cells, comprises two dyes, namely: the CellROX® Deep Red, a ROS reporter, and the SYTOX® Blue, a "viability” dye. CellROX® Deep Red is cell permeable, cytoplasmic and does not fluoresce in a reduced state, while it becomes fluorescent upon oxidation. The second dye, SYTOX® Blue, is a cyanine nucleic acid stain which only diffuses into membrane-damaged cells. Only one epifluorescence microscopy study has used the CellROX® Deep Red to visualize oxidative stress in ionophore-treated Bacillus subtilis, whereas SYTOX® Blue has been previously used to assess bacterial membrane integrity by flow cytometry [13-15]. However, flow cytometry (FCM) has never been applied to correlate oxidative stress and viability in bacteria using the combination of these two dyes. The aim of this study was to assess the ability of the CellROX® Deep Red dye to detect oxidative stress in bacteria and to monitor membrane integrity using SYTOX® Blue. Specifically, FCM was used to assess the effect of various concentrations of hydrogen peroxide on Enterococcus faecalis and Fusobacterium nucleatum. The capacity of the combination of CellROX® Deep Red and SYTOX® Blue to distinguish non-oxidized (CellROX® Deep Red negative cells) from oxidized (CellROX® Deep Red positive cells) and membrane-damaged bacteria (SYTOX® Blue positive cells) was further investigated. A Gram-positive bacterium, Enterococcus faecalis (E. faecalis 135737, culture collection of the University Hospitals of Geneva, CH) and a Gram-negative bacterium, Fusobacterium nucleatum (Orale Mikrobiolgie Zurich culture collection - OMZ 598) have been used in this study. E. faecalis and F nucleatum were cultured from frozen stocks onto Columbia and Schaedler agar plates respectively. Bacteria from agar cultures were transferred in liquid media and incubated overnight at 37 °C (stationary phase). Brain heart infusion has been used as liquid media for E. faecalis and Schadler broth for F. nucleatum (all from Oxoid AG, Pratteln, Switzerland). Cultures of F. nucleatum were maintained under anaerobic conditions using packs of carbon dioxide (GasPack Anaerobe Gas Generating Pouch system with indicator, Becton Dickinson). On the day of the experiment bacteria were centrifuged and re-suspended in NaCl 0.9% to spectrophotometrically adjust the bacterial concentration at OD,600nm 0.2: ~1.2 x107 bacteria, Biowave II,’ Biochrom WPA, Cambridge, GB). Hydrogen peroxide 3% w/w (Bichsel AG, Interlaken, Bern, Switzerland) has been used to induce oxidative stress in bacteria. To ensure that oxidative stress was measured on live cells, a H2O2 dose-response was determined for both strains using the LIVE/DEAD BacLight Bacterial Viability kit (Life technologies, Switzerland) and the Accuri C6 flow cytometer as previously described (BD Accuri Cytometers, Ann Arbor, USA) [16,17]. Briefly, 100μL of bacterial suspension have been mixed with 100μL of hydrogen peroxide at different concentrations (from 0 to 980mM in samples) and incubated at 37 °C for 15min before staining with the LIVE/DEAD solution. A sublethal range of H2O2 was defined as concentrations causing less than 10% cell death. To define an optimal labeling concentration of CellROX® Deep Red (Life technologies, Switzerland) for E. faecalis and F.nucleatum, bacteria have been exposed to maximal sublethal H2O2 concentrations (as defined by the viability curve), during 15min at 37 °C. Cultures were then incubated with various concentrations of CellROX® Deep Red (0μM, 0.5μM, 1μM, 2μM, 4μM and 8μM) during 30min. After incubation, bacteria were sonicated 20sec to disperse aggregates (35kHz, Sonoroex, Bandelin electronics, Berlin, DE) and fixed with 3.7% formaldehyde (VWR International AG, Dietikon, Switzerland). Fixation has been performed for biosafety reasons. To verify that the CellROX® Deep Red fluorescence increased accordingly with oxidative stress, bacterial samples were exposed to different concentrations of H2O2 (from 0mM to 160mM in samples) for 15min at 37 °C. The samples have then been incubated with 4μM CellROX® Deep Red (previously determined working concentration) during 30min at 37 °C, sonicated 20sec and formaldehyde fixed. Control samples were labelled with 4μM CellROX® Deep Red without prior exposure to H2O2. To test whether the combination of CellROX® Deep Red and SYTOX® Blue would identify different bacterial oxidative states, samples of E. faecalis and F. nucleatum have been exposed for 15min to different concentrations of H2O2 (0mM- 980mM in samples) and then incubated with 4μM CellROX® Deep Red for 30min at 37 °C. Controls including non-oxidized (0mM H2O2), oxidized (maximum sublethal H2O2 concentration) and membrane-damaged (980mM H2O2) cells were used for comparisons. Samples were then sonicated 20sec, and SYTOX® Blue added to a final concentration of 4μM. Incubation with the SYTOX® Blue was continued for 15min. Experiments using both CellROX® Deep Red and SYTOX® Blue have been made on live cells (no formaldehyde fixation). Samples have been analyzed using a Gallios flow cytometer (Beckman Coulter, California, USA). Prior to analysis, unlabeled bacteria were run to optimize voltage settings (trigger on the FSC, voltage 650 on the FL-6 channel, 500 on the FL-9), and flow rate was set on low. Bacterial events were discriminated from debris using forward (FSC-A) and side scatter (SSC-A). Doublets have been excluded for analysis by FSC-height and width. CellROX® Deep Red signal (excitation/emission; 644/665) was collected in the FL6 channel (BP 660/20) and the SYTOX® Blue signal (excitation/emission; 444/480) in the FL9 channel (BP 450/50). Gates applied for population discrimination were set manually based on control samples. Data were exported and analyzed with FlowJo software (FlowJo for Windows, version 10.0.06, 2014, Tree Star Inc., Ashland, Oregon, U.S.A.). The geometric mean of fluorescence intensities (MFI) was expressed as relative fluorescence units (RFU). All experiments were performed in triplicate and repeated 3 times. Results were statistically analyzed using one-way analysis of variance (ANOVA) and Tukey multiple comparison intervals (α = 0.05). Concentrations of H2O2 up to 80mM and 40mM were respectively applied on E. faecalis and F. nucleatum without inducing more than 10% reduction in viability (data not shown). Therefore, these concentrations were defined as the maximum oxidative stress to be applied on E. faecalis and F nucleatum, and were retained to determine an optimum working concentration of CellROX® Deep Red for measuring oxidative stress. Control suspensions (0μM CellROX® Deep Red) of E. faecalis and F nucleatum respectively exposed to 80mM and 40mM H2O2 displayed a natural fluorescence around 300 RFU (Figure 1A & 1B). Concentrations of CellROX® Deep Red ranging from 0.5μM to 4μM resulted in increased fluorescence intensities in both bacterial species. At 4μM CellROX® Deep Red, fluorescence intensities reached 2807±945 RFU and 3104±1151 RFU for E. faecalis and F. nucleatum respectively. Further increasing CellROX® Deep Red concentrations to 8μM resulted in decreased fluorescence intensities, for both strains (Figure 1A & 1B). Therefore, 4μM has been selected as the optimal concentration of CellROX® Deep Red for measuring oxidative stress in E. faecalis and F. nucleatum. Control cultures (0mM H2O2) labeled with 4μM CellROX®	Deep Red displayed a fluorescence of 648±90 RFU for E. faecalis	and 1138±396 RFU for F. nucleatum (Figure 1C & 1D). For both strains, increasing concentrations of H2O2 progressively increased CellROX® Deep Red signal. For E. faecalis, the fluorescence signal was maximal at 80mM H2O2 (3001±633 RFU), whereas F nucleatum exhibited maximal fluorescence intensities at 40mM H2O2 (3753±1575 RFU) (Figure 1C & 1D). These H2O2 concentrations corresponded to the maximum sublethal values of each strain. Increasing H2O2 concentrations above these values resulted in decreased CellROX® Deep Red fluorescence in both strains. Flow cytometric analysis of non-oxidized controls (0mM H2O2) showed 96.2% of E. faecalis and 85.6% of F. nucleatum with low signals for both CellROX® Deep Red and SYTOX® Blue (Figure 2A & 2E). Oxidized controls (samples under maximal H2O2 stress) exhibited increased CellROX® Deep Red signal (Figure 2B & 2F). At 160mM H2O2, bacteria of both strains displayed increased SYTOX® Blue signal (Figure 2C & 2G). When exposed to 980mM H2O2, 97.1% of E. faecalis and 98.8% of F. nucleatum exhibited a SYTOX® Blue positive signal in addition to the CellROX® Deep Red fluorescence (Figure 2D & 2H). Notably, CellROX® Deep Red signal intensity decreased in E. faecalis at H2O2 concentrations above 80 mM (Figure 2B-2D). In the current study, we successfully applied both the CellROX® Deep Red and the SYTOX® Blue to a Gram-positive and -negative bacterium to measure oxidative stress and to discriminate non-oxidized from oxidized and damaged cells. Concentrations of hydrogen peroxide selected to induce oxidative stress were in the millimolar range (40mM-80mM). Previous studies have shown that E. faecalis exposed 15min to H2O2 retains viability up to 15-20mM [18,19]. The higher concentrations reported in the current study may be attributed to the different methods used for viability measurement. Whereas FCM in combination with the LIVE/DEAD staining has been used in this study to evaluate membrane integrity, previous studies measured viability by culture plating techniques . There is evidence showing that bacteria proliferation capacity is affected at lower concentrations of H2O2 than membrane integrity [21-23]. An optimal concentration of CellROX® Deep Red has been determined by testing several concentrations of dye on stressed bacteria. Results indicate that fluorescence increased when increasing concentrations of dye up to 4μM, but tended to decrease at 8μM (Figure 1A & 1B). This pattern of signal intensity suggests equilibrium between the dye and oxidants. At concentrations below 4μM, the dye would be saturated by oxidants and additional oxidative stress would not be detected by lack of free dye. Therefore CellROX® Deep Red at 4μM has been selected as the optimal labeling concentration in these bacterial strains. The tendency of fluorescence to decrease at concentrations above 4μM, may be explained by a phenomenon of FRET quenching since the excitation/emission spectra of the CellROX® Deep Red overlap (644/665nm) . Samples labeled with 4μM CellROX® Deep Red and exposed to increasing oxidative stress displayed gradually increasing fluorescence signals with highest intensities at the maximal sublethal H2O2 concentrations. These data confirm that CellROX® Deep Red fluorescence increased accordingly with the oxidative stress applied. Notably, F nucleatum exhibited higher fluorescence intensities than E. faecalis at all H2O2 concentrations tested (Figure 1C & 1D). A possible explanation might be related to a higher uptake capacity of CellROX® Deep Red by F. nucleatum, since the bacterium has a larger cytoplasm; E. faecalis measures about 1μm while F. nucleatum reaches 5-25μm [25,26]. Also strict anaerobes as F. nucleatum, are more sensitive to oxidative stress probably due to enzymes particularly prone to oxidation, as those containing exposed glycyl radicals and low-potential iron sulfur clusters [27,28]. Reaction with these targets may lead to further oxidative reactions potentially responsible for higher ROS production and fluorescence signal in F. nucleatum. The combination of CellROX® Deep Red and SYTOX® Blue showed that control cells (0mM H2O2) displayed a double negative signal and were located in quadrant 4 (Figure 2A & 2E). On the contrary, oxidized controls (40mM and 80mM) displayed an increased CellROX® Deep Red signal, testimony of oxidative stress; these bacteria were located in quadrant 3 (Figure 2B & 2F). For both strains an uptake of SYTOX® Blue at H2O2 concentrations above sub lethal values (160mM) was observed, thereby confirming that membrane injury occurred under such elevated oxidative stress (Figure 2C & 2G). In E. faecalis, sub-populations characterized by different intracellular concentrations of dyes were observed, possibly indicating intermediate states of membrane injury (Figure 2C). 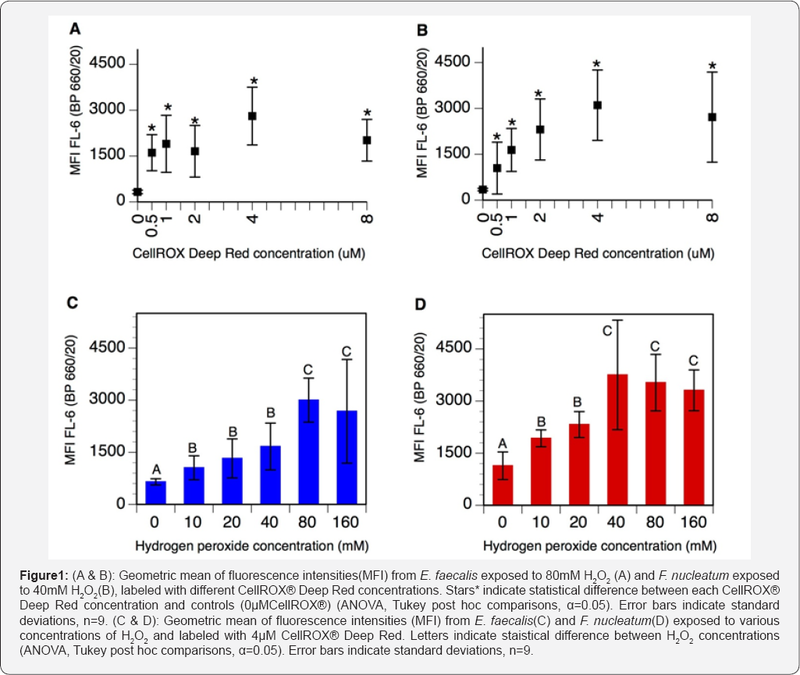 Membrane- damaged controls (980mM) showed bacteria positive for both CellROX® Deep Red and SYTOX® Blue (Figure 2D & 2H). This is not surprising as the membrane-damage of these cells was produced by an excess of oxidative stress. However, E. faecalis cells lost CellROX® Deep Red fluorescence possibly due to a leakage of the dye from the cytoplasm, since membrane injury was shown to occur at such elevated H2O2 concentrations (Figure 2B-2D). The presence of an outer membrane in the Gram-negative bacterium, F. nucleatum, may have accounted for a better cytoplasmic retention of the CellROX® Deep Red dye. Gram-positive and -negative bateria have previously been shown to react differently to the same staining protocol . The results of the current study indicate that the CellROX® Deep Red dye can be used to measure oxidative stress in E. faecalis and F. nucleatum. The combinational use of CellROX® Deep Red and SYTOX® Blue allowed the identification of nonoxidized, oxidized and damaged bacteria. Future studies seem warranted to assess the reactivity of the CellROX® Deep Red dye in presence of other oxidative challenges. 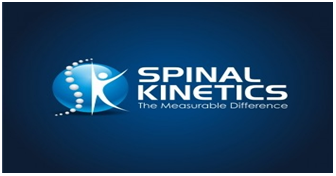 This study was supported by Grant #31003A-149962 of the Swiss National Science foundation. Mr. Aubry- Lachainaye JP and Mrs. Gamerio C are acknowledged for their contribution during flow cytrometry analysis. The authors deny any conflicts of interest related to this study. Vatansever F, de Melo WC, Avci P, Vecchio D Sadasivam M, et al. (2013) Antimicrobial strategies centered around reactive oxygen species- bactericidal antibiotics, photodynamic therapy, and beyond. FEMS Microbiol Rev 37(6): 955-989. Haghdoost S, Sjolander L, Czene S, Harms-Ringdahl M (2006) The nucleotide pool is a significant target for oxidative stress. Free Radic Biol Med 41(4): 620-626. Cabiscol E, Tamarit J, Ros J (2000) Oxidative stress in bacteria and protein damage by reactive oxygen species. Int Microbiol 3(1): 3-8. St Denis TG, Huang L, Dai T, Hamblin MR (2011) Analysis of the bacterial heat shock response to photodynamic therapy mediated oxidative stress. Photochem Photobiol 87(3): 707-713. Mylonas C, Kouretas D (1999) Lipid peroxidation and tissue damage. In Vivo 13(3): 295-309. Liao JC, Roider J, Jay DG (1994) Chromophore-assisted laser inactivation of proteins is mediated by the photogeneration of free radicals. Proc Natl Acad Sci USA 91(7): 2659-2663. Halliwell B (1994) Free radicals, antioxidants, and human disease: curiosity, cause, or consequence? Lancet 344 (8924): 721-724. DeLoughery Z, Luczak MW, Zhitkovich A (2014) Monitoring Cr intermediates and reactive oxygen species with fluorescent probes during chromate reduction. Chem Res Toxicol 27(5): 843-851. Huang YY, Nagata K, Tedford CE, McCarthy T, Hamblin MR, et al. (2013) Low-level laser therapy (LLLT) reduces oxidative stress in primary cortical neurons in vitro. J Biophotonics 6(10): 829-838. Eid AA, Gosier JL, Primus CM, Hammond BD, Susin LF, et al. (2014) In vitro biocompatibility and oxidative stress profiles of different hydraulic calcium silicate cements. J Endod 40(2): 255-260. Kasimova KR, Sadasivam M, Landi G, Sarna T, Hamblin MR, et al. (2014) Potentiation of photoinactivation of Gram-positive and Gram-negative bacteria mediated by six phenothiazinium dyes by addition of azide ion. Photochem Photobiol Sci 13(11): 1541-1548. Subramanian M, Goswami M, Chakraborty S, Jawali N (2014) Resveratrol induced inhibition of Escherichia coli proceeds via membrane oxidation and independent of diffusible reactive oxygen species generation. Redox Biol 2: 865-872. Raatschen N, Wenzel M, Ole Leichert LI, Duchting P (2013) Extracting iron and manganese from bacteria with ionophores -a mechanism against competitors characterized by increased potency in environments low in micronutrients. Proteomics 13(8): 1358-1370. Tashyreva D, Elster J, Billi D (2013) A novel staining protocol for multiparameter assessment of cell heterogeneity in Phormidium populations (cyanobacteria) employing fluorescent dyes. PLoS One 8(2): e55283. Olsen RO, Hess-Erga OK, Larsen A, Hoffmann F, Thuestad G, et al. (2016) Dual staining with CFDA-AM and Sytox Blue in flow cytometry analysis of UV-irradiated Tetraselmis suecica to evaluate vitality. InterResearch Aquat Biol 25: 39-52. Manoil D, Filieri A, Gameiro C, Lange N, Schrenzel J, et al. (2014) Flow cytometric assessment of Streptococcus mutans viability after exposure to blue light-activated curcumin. Photodiagnosis Photodyn Ther 11(3): 372-379. Manoil D, Filieri A, Schrenzel J, Bouillaguet S (2016) Rose bengal uptake by E. faecalis and F. nucleatum and light-mediated antibacterial activity measured by flow cytometry. J Photochem Photobiol B 162: 258-265. Frankenberg L, Brugna M, Hederstedt L (2002) Enterococcus faecalis heme-dependent catalase. J Bacteriol 184(22): 6351-6356. Baureder M, Reimann R, Hederstedt L (2012) Contribution of catalase to hydrogen peroxide resistance in Enterococcus faecalis. FEMS Microbiol Lett 331(2): 160-164. Caron GN, Stephens P, Badley RA (1998) Assessment of bacterial viability status by flow cytometry and single cell sorting. J Appl Microbiol 84(6): 988-998. Joux F, Lebaron P, Troussellier M (1997) Succession of cellular states in a Salmonella typhimurium population during starvation in artificial seawater microcosms. FEMS Microbiology Ecology 22(1): 65-76. Berney M, Weilenmann HU, Egli T (2006) Flow-cytometric study of vital cellular functions in Escherichia coli during solar disinfection (SODIS). Microbiology 152(6): 1719-1729. Davey HM (2011) Life, death, and in-between: meanings and methods in microbiology. Appl Environ Microbiol 77(16): 5571-5576. Silvius JR, Nabi IR (2006) Fluorescence-quenching and resonance energy transfer studies of lipid microdomains in model and biological membranes. Mol Membr Biol 23(1): 5-16. Kokkinosa A, Fasseas C, Eliopoulos E, Kalantzopoulos G (1998) Cell size of various lactic acid bacteria as determined by scanning electron microscope and image analysis. Le Lait 78(5): 491-500. Marsh PD, Martin MV (2009) Oral Microbiology. In: Marsh PD, Martin MV (Eds. ), Oral Microbiology. (5th edn), Churchill Livingstone Elsevier, London, p. 38. Imlay JA (2003) Pathways of oxidative damage. Annu Rev Microbiol 57: 395-418. Imlay JA (2008) Cellular defenses against superoxide and hydrogen peroxide. Annu Rev Biochem 77: 755-776. Berney M, Hammes F, Bosshard F, Weilenmann HU, Egli T, et al. (2007) Assessment and interpretation of bacterial viability by using the LIVE/ DEAD BacLight Kit in combination with flow cytometry. Appl Environ Microbiol 73(10): 3283-3290.